anything you can do? Is reviving your lawn this late in the season even worth it? Of course it is! Proper lawn care, especially in the fall, will ensure that your grass grows back thick, green, and luscious come spring. If you don’t know how to take care of your lawn during the fall season, check out these tips. Keep Watering – First things first, don’t shut off your sprinkler system. Even though the weather is cooler and you aren't as thirsty as you were over the summer, it doesn't mean your lawn feels the same way. Keep watering on schedule. You want to make sure your lawn stays lightly saturated even when the temperature drops, as this will keep the blades from drying out before they go dormant. Time for a Trim – If you raised the height on your lawnmower blade over the summer, now is the time to lower it back down. During the fall season, you want to cut your grass a little shorter than you did in the summer. Since harmful UV rays are no longer a threat, you don’t need the long blades of grass to protect the shorter ones. 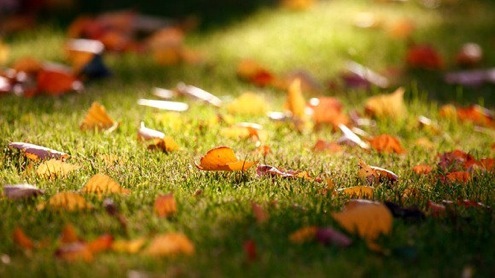 You want your grass shorter; that way, fallen leaves and snow don’t weigh down the blades and distress your lawn. Seed – We know this may sound silly, but autumn is the perfect time to seed your lawn. Seed cool-weather grass like rue-grass or bluegrass, as this will fill in any dead spots and will help your grass grow back thicker and greener in the spring. Plant the cool-weather grasses early, so that they have plenty of time to take root before the first snowfall. Remove Leaves – Stay on top of leave removal, as leaves can damage and smother your lawn. If you want healthy blades of grass come spring, you’d better keep your grass clear of twigs and dead leaves. We know this can be a tedious job, but just think about how beautiful your spring lawn will look and how happy you’ll be that you don’t have to remove heavy, wet, soggy, dead leaves come spring.